Get the training you need, connect with school psychology experts, and experience the fun and excitement of San Antonio at the NASP 2017 Annual Convention. Join us February 21–24 and renew your passion for the profession! Registration will open on October 3, 2016. Plan to register by November 9 to save $50 with the early registration rate and be entered for a chance to receive a complimentary registration. Start planning your getaway by learning more about the convention and hotel fees. Complete details about convention advertising opportunities are now available, including the exhibitor prospectus, exhibitor prospectus contract, and sponsorship brochure. As an exhibitor or sponsor, reach nearly 6,000 convention attendees focused on learning about the latest and most effective products, services, training, and best practices to improve their skills. Thank you for joining us at the NASP 2019 Annual Convention in Atlanta, GA. It is always wonderful to meet members face-to-face and hear about your experiences in universities and in practice. We hope you gained valuable insights from each session you attended and feel refreshed and rejuvenated for the remainder of your school year. Congrats to our #NASP50Forward contest winners: Kenyatta Braggs, Samantha Williams, Jessica Richard, Lauren Layman, Niekema Hudson, and Jennifer Moore. Mark your calendar! 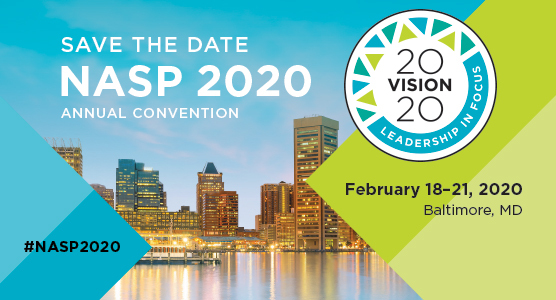 The NASP 2020 Annual Convention will be February 18–21, in Baltimore, MD at the Baltimore Convention Center. If you’re missing handouts from a particular session or need to download another copy, search by session number below. You can also preorder Session Recording Packages, available for viewing beginning in April 2019 on the NASP Online Learning Center, to earn documented CPD on your time.